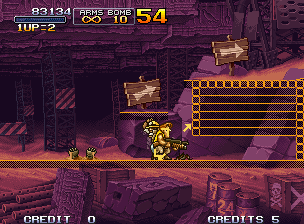 There's a Debug Menu in many titles from the Metal Slug series. 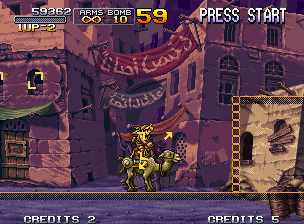 Today I played around with that debug menu in Metal Slug X, especially I turned on 'body rect' and 'attack rect', which revealed how the game works. Now not only did I have tons of hours of fun, I also studied a lot from this amazing game! Of course the following are only my observations, or my best guess on how they have been implemented the game. Although I think my interpretation should work, but it's definitely not the only way, and it's quite possible that the developers have achieved the same effect with another (maybe better) method. At the first glance, the debug drawing is far cleaner than I had expected, it seems that it's not tiled based physics at all. But note the thin shadowed area below the line, which may imply that it's still using tiled based calculation somehow. The ground is described as line segments, from the way the shadow is drawn I think that those are directed edges, so we know that on which side shall we keep things. Actually I think that all the edges are half-platforms, will talk about that below. In this picture, an obstacle is mark with 3 line segments, clever & cute! Besides the edges, there are two types of rectangles, 'body rects' (marked with a pair of right angles) and 'attack rects' (marked with a pair of arrows). All the rectangles are axis aligned, even if they disagree with the visual. 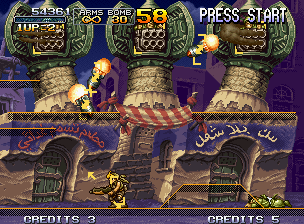 The missiles in the above pictures are heading toward different directions, but their body rects are still AA. Sometimes we need to approximate the shape with multiple rectangles, for example in the pictures below. 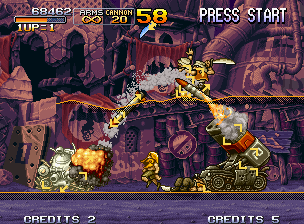 Note the attack rects on the boss, marking the effective area of the spikes. My interpretation of the rectangles is that they are using for hitting detection. Attack rects mark the effective area of attacking, and body rects mark the effective area of receiving damages. 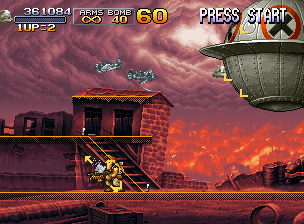 About the attack rect of the player, I think it marks the melee range. So let's try to talk about all possible ways of collidings. Terrain collide with mobs only. Since terrain is mostly marked as line segments, for each mob it is easy to find out which point on the ground is supporting it. One way of doing this is by casting a gravity direction ray right below the mob and find the first intersection point with the terrain. 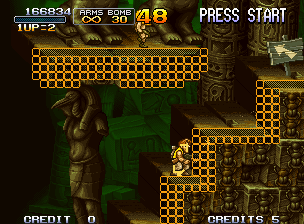 The stacked squares are used to block the player. I think that it may be easier to implement this way than vertical line segments. Also I think the squares are not static body rects, why? see below. Sometimes multiple squares are used, not sure why, maybe to avoid bugs? 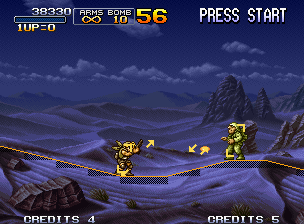 Also note that the body rect of the player is colliding with the them, so this proves that body rects are not used for terrain colliding detection. Instead I think that the foot point (don't know the actual term, I just mean the mid-point between the feet) is used. 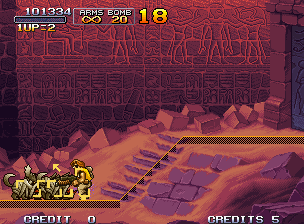 The entrance of a cave, the line segments with squares around them are reversed platforms, they prevent user going up but not going down. This picture also proves that the foot point is used. 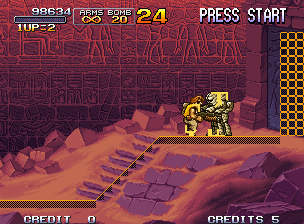 - Why using all those reversed platforms inside (the door and the cave) entrace? I think it's enough to use the lowest one only. One possible answer is for robust. 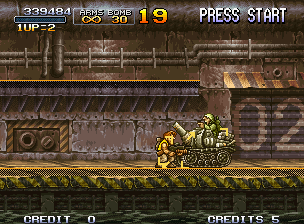 When a slope intersects with horizontal edges, special care must be taken, as marked in the screenshot. Interesting. Attack areas only collide with mobs. It's pretty straightforward, if a mob collides with an attack rect, it may receive damage - need more logic checking, e.g. friendly fire. There are also other cases like saving hostages. It's too intuitive to put more words here. 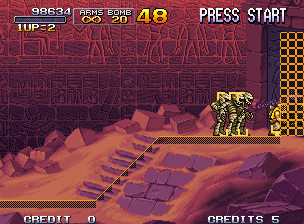 This is the rightmost position I can reach from the left side of mummies. Note that I can jump into them from above, but will get pushed away gently. 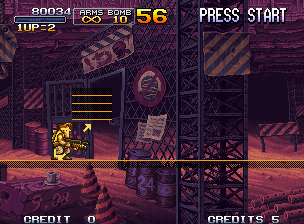 This is the leftmost position I can reach from the right side of zombie dogs. Note that in this case if I try to jump onto them, I will bounce up instead of fall through. 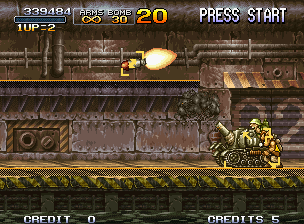 With tanks it seems to be more complicated, it behaves differently when I try to approach from left and right. I didn't figure out if it's using the foot point of the body rect. There could be another type of rectangle, or there's an offset on the x axis. So these are what I've got so far. I don't know why I haven't though of this idea before. The using of directed edges and foot point is quite effective, since it's point-line segment intersections, which is much faster than polygon intersectons, or even AABB. Tunneling effects can be detected this way. 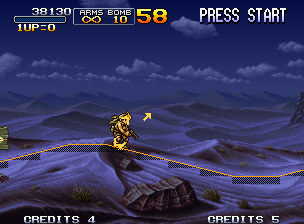 And jump platforms are natural to implement. 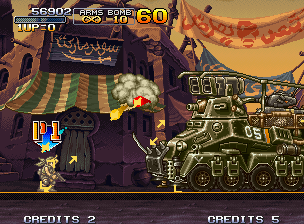 On the other hand, this design justifies for Metal Slug, but may not for other games. Because the body rects may collide with the terrain, which may look weird in pure tiled based games like Super Mario. 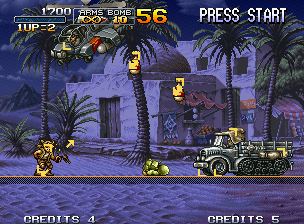 In Metal Slug, however, it's ok, since the background is not tiled, and we can see 'side faces' of '3d objects'. 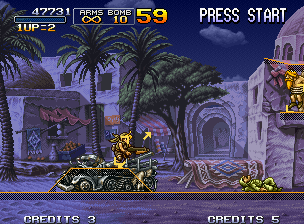 Metal Slug has always been one of my top favorite games. Now there's a new way to play with more fun! I'd like to play through the series again with all the rectangles turned on!